Good Morning! Thank you for stopping by. The sketch is up at Tuesday Morning Sketches and it's a lovely one inspired by Jessi. Why do I say inspired? Because Jessi creates cards and then sends them to me to "sketch-ify." I love this one, it's definitely the sketch to use again and again. My card features one of my favorite images from this week's sponsor, Digital Delights by Louby Loo. This is Jubbly Giraffe and is sooo adorable! It is absolutely perfect for a baby card. My card features paper I've had for very long time by Basic Grey. I tried a tip by Julie Ebersole to run a thin line of Stickles around the image. I embossed the sentiment with gold on vellum and then hand-stitched the vellum to the pink strip. The sentiment is from MFT Stamps. I finished it with a few sequins from Pretty Pink Posh and Craft Medley. 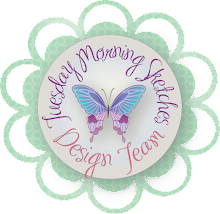 Please join us over at TMS and be sure to visit my team's blogs - they work hard to inspire you week after week. They deserve a little love. Hello! Thank you for stopping by. This week's TMS sketch is up and it's awesome! This one is created by Debbie and it truly inspired. Our sponsor this week is Sami Stamps, however, my card isn't featuring one of her images. The other team members did great with her images and Sami is always so generous to give us stamps, I just don't want to get greedy. So my card today features two stamps by Fun Stampers Journey. I actually used, finally, the Grand Caliber that I got with my FSJ Coaches kit. It's bulky. Not a complaint - a learning experience. I've used Cuttlebug for so long, this was.... bulky. But I used it with a Spellbinders embossing folder because the folder wouldn't go through the Cuttlebug. The stamp sets are Sweet You (SS-0099) (flowers) and Every Day (SS-0164) (sentiments). I stamped the images with Black Licorice Fusion ink to test how well they stand up to Copic coloring. Not too bad! The paper I used is from a Botanicals paper pad I picked up on clearance at Hobby Lobby last year. I did add some shimmer to the roses and leaves with clear Wink of Stella but the picture didn't capture it as well. I hope to bring you more cards and projects sharing the beautiful images from Fun Stampers Journey, but so far, my wallet isn't allowing me to. So I may end up overdoing the 3 stamps and 1 ATC stamp that I have. Crossing fingers, praying and thinking happy thoughts that I'll hear if I get another promotion at work. Thanks again for stopping by. I do appreciate your visit and please be sure to visit my amazing team and leave them some love. They deserve it. Have a great week. See you over at TMS. Hello! Happy Sunday. I hope you're enjoying your weekend. Mine has been pretty uneventful and I like it like that. I've enjoyed my day so far - it's nearly 2:00 in the afternoon and I'm still in pajamas. I've made a couple of cards enjoyed a favorite coffee this morning and then followed up later with a really yummy lunch. So I haven't played along with challenges in a long time. In fact, so long, that I hadn't realized that so many of my favorites had closed down. :0( I was glad to see some others still thriving. 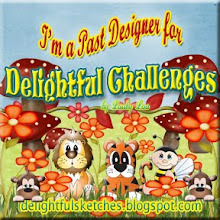 My card today features the sketch from Catch the Bug challenge along with a Bugaboo image, Tulip Tag. 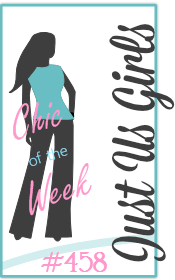 I'm also playing along with Just Us Girls (add a tag), Crafty Friends (girly) and Color Throwdown. Color Throwdown said to use pink, purple/mulberry, hot pink and metallic gold. My card features very little hot pink since I don't like hot pink, but it's in there giving depth to those tulips. Mulberry, which is a reddish purple is in the ribbon and butterfly and the gold.... I foiled the outside edge of the tag using Zig 2-Way glue pen and foil by Thermo-Web. This is not the best for solid coverage. I like how this looks distressed. I even used a metal tool to apply the foil in places to make it look like brushed gold. Just us Girls said to add a tag - that was easy with this cute image from Bugaboo Stamps. Crafty Friends said make this girly - not sure how much more girly and feminine this card can get! It was really fun to play just for the sake of playing. I'm not on anymore design teams, the last term just ended and Cut Cardstock keeps turning me down. Maybe that's just how it's supposed to be for now. Have a great rest of your day and thank you for stopping by. Good Morning! The newest sketch is up at Tuesday Morning Sketches and it's so sweet! I hope you love it as much as I do. My card features mostly papers from The Delightful Stack by DCWV. I made a 3D house out of this paper but I still have a lot left.... so I made birthday bag/card for my friend and since it was still out, I decided to make another birthday with the scraps. The label looking image is an ATC stamp (Label It) by Fun Stampers Journey, the sentiment is a Penny Black stamp that I've had for probably 15 years. I made the candles from a couple of scraps. It's sweet, simple and will mail without any extra postage. Be sure to stop by TMS blog. 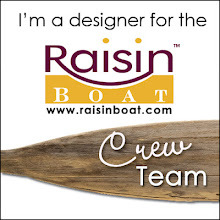 We've added a fantastic member to the Design Team. Her name is Lee and I think she's going to bring you lots of cool designs. I love my team, they all have their own style which makes TMS well rounded and an inspiration to everyone. Have a great day! Thanks for stopping. I'm sharing a Valentine's Day treat that I'm making for my teacher friend of my sister's. She teaches ECE (Early Child Education), so this treat needs to be 3-4 year old friendly. Mastiff Hug gift card holder by Jennifer Rush was perfect for this! Saturday is tutorial day, but I can't improve upon Jennifer's assembly tutorial of this sweet gift card holder, so instead, I'm bringing you an idea. This goes together pretty easily and I didn't embellish because I didn't want choking hazards. I did size this down so that the main piece plus the main face piece fit on an 8 1/2 x 11 piece of card stock. The part that creates the pocket has a fold to enclose a gift card. I removed that part so all I had left was a pocket. I tucked in the arms and then glued the heart down. I think when I move into mass production mode, I will at least get some red glitter paper for the heart. I did fill in the eyes with glossy accents. I also think I'll ink the edges a bit with some Oatmeal Cookie ink by Fun Stampers Journey. Jennifer has so many cute puppies, please be sure to visit DigiPlayground and grab a whole kennel collection! Thanks for stopping by for a visit. Good Morning! I hope everyone had a great Monday. Mine was OK - very busy and I was just too tired to face it. But we press on! The last revisited sketch is up and this one is my favorite, too, but this is Kris' pick. She's also our sponsor and she's offering a fantastic prize. Now my card is featuring some very new things for me. Most are old but, the stamps, dies and a couple of the inks are very new to me. I've decided to go into party plan again. If you're a follower of mine that has been with me for awhile, then you know I used to be a Stampin' Up! demonstrator. And it was fun. But you also know that I got out because the financial commitment was too great and I just wasn't getting the parties. Not to mention the box you get put in and there is sooo much out there worth exploring. Well, despite the cons, I'm doing it again. 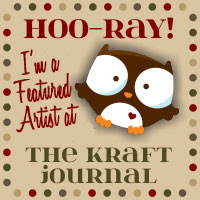 I've signed up to be a Journey Coach with Fun Stampers Journey. We'll see just have to see what happens. I'm hoping to do a party a month so that I'm a little more social again. That was the big PRO. But here's a card I made featuring a stamp set called Bird Tweet and sentiment set called Every Day. The only inks that I used that is FSJ is the blue flower - the color is called Beach Breeze and the sentiment is stamped with Black Licorice. The bottom on of the bird I didn't get quite the blending I was hoping for but it still turned out really cute. The fishtail banner I made by covering a piece of card stock with purple polka dot washi tape that I got from Target. The vellum doily is from retired die by MFT. The circle is cut from circle dies by MFT and then embossed with a chevron pattern embossing folder by Cuttlebug. Please join us at TMS, we'd love to have you play along. Be sure to read the whole post, we're having a DT call. Have a great week! Thank you for your visit.